It's almost exactally like the Dreamcast version in terms of visuals, but the framerate is lower, the animation frames are lower and the HUD is a bit dumbed down. Not exactally a game with visual variety, either. Again, sounds like the Dreamcast version, but dumbed down. It's a little trickier to play this game without the four face buttons of the Dreamcast controller, but Sega and Sonic Team came up with a few creative configurations that make things easier. The "arcade" modes won't last long, but the huge assortment of puzzles will. It's very faithful and very similar to the Dreamcast counterpart, and with the large amount of puzzles, it's more single-player friendly than it was before. Those who loved the Dreamcast version will like the GBA version. There's nothing new or different in terms of design, but there are a great number puzzles that the Dreamcast version lacked. 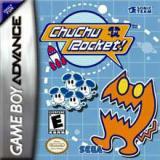 Chu Chu Rocket is basically a near-perfect port of the Dreamcast version of the same game. The graphics are nearly identical, the music is identical, as is the gameplay. The only thing that didn't translate so well was the controls. The Dreamcast pad had four function buttons to place down the directional tiles. It was easy to understand, and kept the gameplay at a quick pace. The GBA only has 4 function buttons, but two are on the shoulder. This makes things a little difficult, but Sega did come up with a couple of solutions. All of them take a couple of minutes to learn. The gameplay of CCR is actually pretty simple. Guide little mice called Chu's into rockets before the cats, Kapu's, get them or fall into holes. To guide them, you place down directional tiles on the ground. Along the way, you can activate Mouse Roulette, which can add mice to your total, add more cats, or even switch your rockets around the field. To win, you need the most mice. Of course, that's easier said than done, since computer opponents or even your friends (via multiplayer) can make you lose mice. CCR has a few modes, in fact all the modes the DC version had except for online gameplay. The 1-4p game and Team Play are about guiding the mice to get the most points. Stage Mode is thirty seconds of trying to meet a challenge. The puzzle mode is a pre-set stage from puzzles created from DC players around the world. Some are very easy, while others are really really hard. The Battle Modes and Stage Modes only go so far, and there are no records to make in like Tetris. But the puzzle mode is well worth the admission. There is over 1000 of them, and you can even make your own to challenge others and trade. This is great when you're trying to kill time. It's the equivalent of a crossword puzzle. CCR is a fairly well rounded package with lots of user customization (you can even customize the mice and cats!) and plenty of multiplayer options. For a puzzle game, it's certainly different, and is a change from stacking things.